When looking at the Irish War of Independence, the historian is faced, not so much with the fog of war as with the jostling of rival ‘frames’, each clamouring for attention, highlighting some facts while downplaying others. A ‘frame’ in the field of media studies, has been usefully defined as “altering of belief importance by ranking one set of considerations above another”. It presents, “a central organizing idea or story-line that provides meaning to an unfolding strip of events…the frame suggests what the controversy is about, the essence of the issue”. The memory of all wars is of course contested, but the conflict in Ireland from 1919-1921 is perhaps more so than most. It was a political and propaganda conflict, as much as a military one. How the conflict could be presented mattered. The result of the struggle would largely be decided by its impact on public opinion in Ireland, Britain and further afield. If enough Irish opinion could be rallied behind the republican cause then the British government could enforce no settlement not agreed with Sinn Fein except by blanket repression. If the prevailing public opinion in Britain was hostile to attempts to do this, then negotiation with the radical nationalists was the one option left. The memory of all wars are of course contested, but the conflict in Ireland from 1919-1921 is perhaps more so than most. It was a political and propaganda conflict, as much as military one. Much of the history of the war since then has essentially been about promoting one of the rival frames of the time. The British one was that the IRA was an unrepresentative, “murder gang”, that was cowardly and risk-averse, that it was sectarian and murdered Protestants and ex-servicemen. 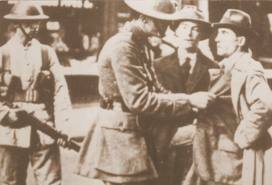 The Irish republican story, on the other hand, presented in organs such as The Irish Bulletin and An tOglach, was one of a whole people resisting British oppression, of the daring and brave guerrillas of the IRA, who took on and defeated vastly superior forces and forced the British to the negotiating table, and whose arms were unsullied by sectarianism or other base considerations. Because of the importance of rival propaganda it has been very difficult to separate the actual military history of the guerrilla war from rival attempts to colour its perception. William Sheehan’s new book, ‘A Hard Local War’, is, at one level a very interesting look at the guerrilla war in Cork, the bloodiest county in Ireland in 1919-1921, from the point of view of the British Army – the challenges posed to it by the IRA and how it adapted its counter-insurgency tactics to get on top of it. Where this book succeeds is where it highlights important elements of how the military aspects of the war should be understood. Where Sheehan’s book falls down is in its championing of, essentially the British ‘frame’ of the time – that the IRA was cowardly, cruel and militarily ineffective. That British attempts to suppress it were, ‘consistent with minimum force’. This review will return to questions of bias and objectivity and why they remain controversial today, but first, it will consider the specifically military history aspects of the book. Sheehan argues for a chronology of the conflict in Cork roughly as follows; rioting in 1918-1919 between locals and troops – sometimes provoked by rows over women, fueled by alcohol as much as by politics. At the same time the IRA raided troops for arms, but very rarely set out to kill them. Phase two was essentially a police versus IRA war, with the guerrillas attacking RIC barracks and shooting police. In mid 1920 this was escalated by the deployment of paramilitary police (Auxiliaries and Black and Tans) and the IRA’s creation of full-time units or ‘flying columns’ in response. From the autumn of 1920 the British Army itself was used more extensively against the insurgency, meaning that by the February and March 1921, the British commander in chief Macready would write that, ‘the rebels in the martial law area carry out operations [which]…frequently resemble a minor military engagement as distinct from small ambushes formed by men who shot and ran away’. But this phase did not last. The British deployed more troops and resources to Cork, including armoured trucks, aircraft and tanks (though the latter seem to have been mainly used for demolishing houses in urban areas). They also changed their tactics, deploying small ‘active service platoons’ to hunt the flying columns, using ariel reconnaissance and mounting huge drives’ of thousands of troops across the countryside. The methods effectively neutralised the Cork flying columns. The British also instituted a much more ruthless policy of executions and internment of IRA fighters. All of this Sheehan argues, inaugurated a final phase, from around April 1921 up to the Truce of July 11, in which the IRA in Cork, weak in men and weapons and poorly trained could no longer fight large scale guerrilla engagements but resorted to the only weapons open to it – assassination of unarmed troops and local loyalists and use of remotely detonated bombs – in Sheehan’s words, ‘terrorism’. This was a phase that had yet to run its course when the Truce arrived to cut it short. There is much to this analysis. The celebrated West Cork Brigade Flying Column fought its last large action against British troops – the Crossbarry ambush – in March 1921. It spent the remaining three months trying to avoid British ‘drives’ and shooting suspected ‘spies’ who might betray their presence. Indeed, Sheehan argues the traditional account of Crossbarry itself has been much mythologised, there were only 150 British troops there, not 1,200 as Tom Barry later claimed. This is an important reminder that, against a well-organised, well-supplied and well-trained conventional military, guerrillas actually tend to do quite badly. The use of assassination and especially the “Improvised Explosive Device” rather than direct combat is an evolution that the Provisional IRA went through in the late 1970s and which we have seen in recent years among insurgents in Iraq and Afghanistan. So this book is an important contribution to the military understanding of the War of Independence and guerrilla warfare generally. But it is not without holes. Conditions in Cork were not necessarily replicated elsewhere, in parts of the west, for instance the flying columns were just taking shape in the summer of 1921. By concentrating on the regular British Army, the book also does not consider the role of the police, both the regular RIC (including their Black and Tan recruits) and the Auxiliaries, which was central to the conflict. 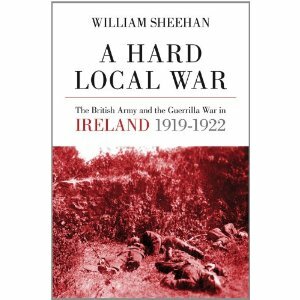 This book is strong in showing the evolution of the British military’s counter-insurgency in Ireland but as a record of the War of Independence, it is at times, blurred by a kind of bias. A ‘frame’ works by highlighting some facts and downplaying others, encouraging a coherent interpretation of one sort. Sheehan’s work is very much within the British frame. The insurgents are depoliticised as far as possible. ‘A Hard Local War’, rather gleefully points out that the highest casualties from a single engagement in Cork city (3 dead and 40 wounded) were the result of riot between British troops and Irish ex-servicemen in 1920. British reprisals are put down to undisciplined soldiery, while the fact that there were fully sanctioned official house burnings (which destroyed 140 homes in counties Cork and Kerry alone) from December 1921 is covered but rather excused as a way of venting the troops’ understandable frustrations at the IRA. Sheehan correctly notes that the IRA identified areas which were directly supportive of their guerrillas and others which were not in every locality. But there are many other mentions in the text of locals lighting bonfires and even shooting flares to warn IRA columns of approaching troops. The implications of this in terms of popular support for the IRA are not commented on. While Sheehan devotes much space to the IRA’s disregard for civilian casualties, he mentions without judgement the British practice of taking civilians as hostages on trucks and cars to prevent IRA attacks. In many of the ‘drives’ Sheehan covers, the British columns shot, ‘civilians who refused to stop when challenged’. There is, in other words, plenty of evidence of rather brutal British counter-insurgency methods in Cork in the War of Independence, including assassination, killing of prisoners and civilians, use of ‘human shields’ and torture. In the context of a low-intensity but significant war, this may still, as Sheehan argues, amount to, ‘minimum necessary force’ but the argument is far from settled and the British record far from above reproach. The question that jumps out at this reviewer is why an Irish historian, happily living and working in the Republic of Ireland, would construct his work to favour the British ‘frame’ of the War of Independence? Fortunately, Sheehan himself answers this question towards the end of the book. Referring to the traditional accounts of the Crossbarry ambush, ‘The danger of these uncritically used ‘false’ histories has been their use by extremists to justify physical force republicanism’. So the function of Irish historians working on the independence period must therefore be to discourage, ‘extremists’ by a dismantling of their version of history. Much of the traditional republican narrative of the period is indeed flawed and self-serving, and much of the history by the ‘revisionist’ school has indeed brought a balance to our understanding. But the promotion of the contemporary version of one side over the other with a present-day goal in mind is not objective history. James Druckman, On the Limits of Framing, Who can Frame?, The Journal of Politics, Vol. 63, No. 4, Nov. 2001, pp.1041-1066. Scheufele, Dietram A, (2000), Agenda Setting, Priming, and Framing Revisited: Another Look at Cognitive Effects of Political Communication, Mass Communication &Society, 2000, 2 (2 &3) 297-316. Written by: John_Dorney on 29 June, 2011.on 5 May, 2012. 4 Responses to "Book Review: A Hard Local War"